My 9 year old 3rd grader loves books. Simply put, he is a voracious reader. Truthfully, I can’t keep up with him. 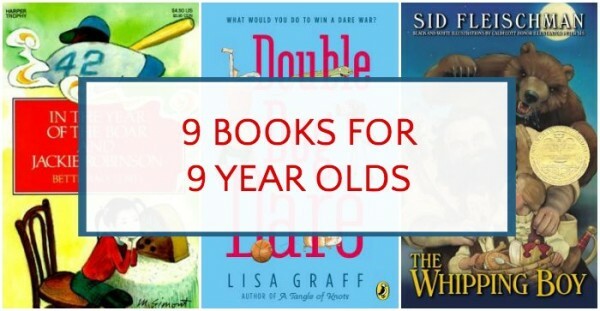 I love watching his reading progression and seeing him read longer and longer books and so this list of books for 9 year olds is a natural sequel to 8 books for 8 year olds. I selected these chapter books because they are titles my 9 year old has recently read. Most “middle grade” fiction is aimed at ages 8 to 12, so these books fall into that reading level, but the subject matter of these particular selections is on the lighter end of middle grade. So of course, these are not just books for 9 year olds! Don’t forget: I publish a new list every Monday so be sure to peruse the index for all my lists. Last month Kiddo came home from school to tell me his 3rd grade teachers were reading In the Year of the Boar and Jackie Robinson aloud to the class. I mentioned I had it at home and he got really excited! I love that he wanted to read the book himself, even though he was hearing it at school. I’ve noticed that exposure to particular books at school is a huge selling point with kids. Have you noticed that with your kids, too? This is a really wonderful story about a 10 year old who moves with her family from China to Brooklyn. In her attempt to understand American culture and be accepted, she focuses on baseball as an entry point, making new friends along the way. The Candymakers. At 480 pages, this is one of the longest books my son has read. He had finished reading another of Wendy Mass’ books, Pi in the Sky, and really enjoyed it, so I was inspired to buy him this one. When 4 kids gather for the Confectionery Association Conference, they end up trying to solve the mystery of a stolen secret ingredient and create the best candy ever. I was impressed that he couldn’t stop reading it, despite its length. Also available as an ebook. Mousenet. I gave this to Kiddo for Christmas and he loved it so much, he read it in a day. I would have bought the sequel, Mousemobile, but it’s only in hardback (and as an eBook) and I am too cheap, so we are getting it from the library. 10 year old Megan and her uncle invent the “thumbtop”, a miniature computer. They set out to change the world by supplying every mouse hole with one. Clever and well-written. Also available as an ebook. When parents tell me their kids have trouble finishing books, I like to recommend The Whipping Boy. It’s a short novel, but just as entertaining and fulfilling as longer books. The vain and snobbish Prince Brat and Jemmy, his whipping boy, are kidnapped by a pair of thieves. A case of mistaken identity is the catalyst for lots of action, humor and interesting plot twists. Plus, it’s a classic from the 1980s and a Newbery winner so you can feel quite satisfied about getting your kid to read it. From the Mixed-Up Files of Mrs. Basil E. Frankweiler. When I was a kid this book was my first impression of what it must be like to live in New York City. Now I am raising kids here so I imagine Kiddo sees the book through a different lens. Claudia and her brother sneak away to live at the Metropolitan Museum. They manage to hang out there for a week, get caught up in a mystery surrounding a statue and and meet the intriguing Mrs. Basil E. Frankweiler. Don’t let your kids grow up without reading it. Also available as an ebook. Double Dog Dare. Here’s another book I gave Kiddo for Christmas and he gobbled up in one sitting. With an opening chapter titled, “A Pair of Boy’s Underwear,” who can blame him? Don’t let the silliness of the chapter titles put you off. This is a terrific, funny book about a “dare contest” (in Kiddo’s words) between two enemies who end up finding common ground in their mischievous ways. Also available as an ebook. Mr. Popper’s Penguins. We listed to the audio version of this book when Kiddo was younger, and also I read it aloud, but still he chose it from the school library to read at home he loves it so much. This classic book from the 40s about a family that adopts a flock of penguins and takes them on tour is guaranteed to be loads of fun. Also available as an ebook. Big Nate. Kiddo loves the Big Nate series. He’s been reading them for a few years, now. Nate has been compared to A Diary of a Wimpy Kid, but I’ve never read those books (nor has my son), so I can’t comment on that. To be completely honest, this is not the kind of book that appeals to me, but Kiddo and his friends gobble them up, so I won’t complain. Big Nate navigates the perils of school life in this combination graphic novel/comic/novel. Also available as an ebook. Charlie and the Chocolate Factory. This classic doesn’t need an introduction. I read it aloud to both boys last year and needless to say it was a hit. I’m pretty sure he’s read it by himself before; it’s hard to keep track of all of his books! However, he recently brought it home from school. Although I encourage Kiddo to read whatever he wants at home, the teachers require him to read books “at his level”. I confess, since my son is not a reluctant reader I don’t pay much attention to what his official reading level is (I find all those numbers and letter levels limiting, anyway), but I do like to have an idea of what his teachers think his comprehension level is. As you know, comprehension and the ability to decode words is not always the same thing. Also available as an ebook. Do you have children on the cusp of middle grade reading? 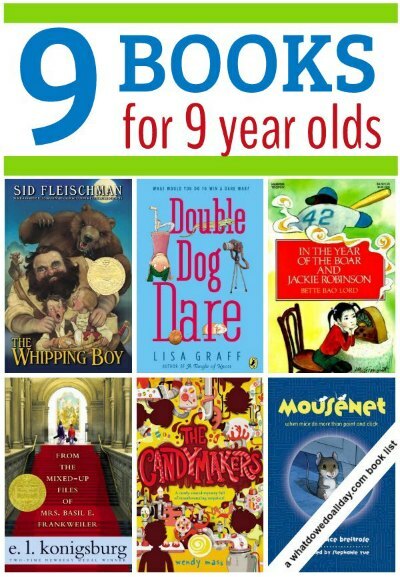 What books for 9 year olds do they enjoy? If you love books as much as we do, you will not want to miss our weekly book list! Subscribe to our newsletter or risk missing out! This list is going to come in very handy for Claire’s book club- thank you! That’s so great that Claire is in a book club! I want Kiddo to join a book club, but it conflicted with karate. My 4th grade son is a voracious reader. It makes me so proud! Thanks for the new titles. We will head to the library to check them out. Thanks for these suggestions — we’ve read a few in the list (The Whipping Boy being our favorite), but some we have not read. I’m putting those on our library list! Great list! So far the only book that we read from it is Charlie and the Chocolate Factory, but I think my daughter might like Candymakers. We loved The Candymakers and The Year of the Boar! That is on our to read list! Just haven’t gotten to it yet! What about The Westing Game? I’m planning on putting that under Kiddo’s nose next. Also, The Enormous Egg and Harriet the Spy! I agree about Mass’s other books, except for Pi in the Sky, they are for older kids. What about the Misty of Chincoteague series, Miracles on Maple Hill, Blue Willow, The Ordinary Princess, and Caddie Woodlawn and sequel, Magical Melons? Ditto!! And you can’t imagine how happy I am to see the words From the Mixed-Up Files of Mrs. Basil E. Frankweiler. For 30 years I have not remembered the title of this book (or is it 40?). I just remember the story and now I know what it’s called, I can read it to my kids!!!! That book – and The Island of the Blue Dolphins and Mrs Frisbee and the Rats of Nimh – all have stayed with me. Those are all wonderful books! I remember them well, too. I always enjoy your recommendations. My 10 year old is an avid reader so we are always in search of new books. Thanks for sharing! Thank you Stacie! I hope you 10 year old enjoys some of these recommendations! I do get comment notifications on older posts. 🙂 Thanks for the recommendation! Great list! You might also like the book I co-created with Jay Stephens titled “Oh, Brother! Brat Attack!” The book is being released October 27, 2015 by Andrews McMeel Publishing (Also published Calvin and Hobbes). We just read Whipping Boy and Mr. Popper’s Penguins. Roald Dahl has long been a favorite! I hope you’ll start linking your reading lists up to our Literacy Musing Mondays Linkup #LMMLinkup. My son loved Young Fredle, and I couldn’t wait to read more of it, too! Also, The Little House on the Prairie series, BFG, Trumpet of The Swans by EB White and Desperaux.